Hinerangi shares her very own spider. This task required each member of our class to read and learn about spiders, particularly how they differ from insects. Fantastic work Hinerangi! Well as you already know that this Spider does not eat other Humans and Insects which means that any predator or Human can get near it. This Spider lives in areas meaning as on Plants, Living under rocks and on the edge of the ocean. They can also live in corals which means that they mainly live in habitat’s that they can find. This spider eats leaves plants and many different Trees. This Spider’s behavior is Kind, Helpful, Special and as you already know that this spider is the most coolest Spider of all, Well here we are now as you already know this Spider is Kind, Helpful, Special and is the most coolest Spider of all. For this task we had to create a new Insect that no ordinary person had used yet. As you can see up the top my insect is called Black Wicked Spider. For this task we also had to draw a picture for our Spider. This task was quite easy because all we had to do was that we had to draw a Picture, Write a description and having to be reading the task's we get. We have been learning to describe insects in more interesting ways. In particular we have been focusing on using interesting and new vocab. Naomi shares her description of a bumble bee. WALT: use interesting vocab in our writing. A bumble bee is harmless and a cute insect, It has six tiny legs and three body parts (head l thorax and the body). 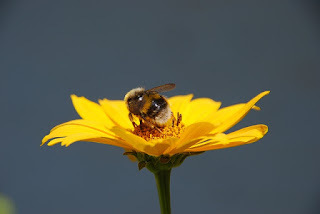 Bumble bees help us, and if we did not have bumble bees or other bees we would probably die. There is a Queen and she has an important job because she stay’s in the hive all day to lay eggs. The other bees are called worker bees, and they mostly do all the work. The worker bees clean the hives and make sure the hive is OK. Bees fly to a flower, and most flowers that catch their eyes are the beautiful purple, blue and yellow coloured flowers. Bees also drink nectar and get pollen on its back and carry It to their hive. There are over 20,000 species of bees and one that make a lot of that sticky good stuff is honey bees. Task description: This task was to learn about bugs and all kinds of native things because our term topic is "Te Taio O Tamaki". Like my WALT we are learning to use describing vocab in writing. Thanks for sharing this Paikea! What a cool insect Horton is. Check out the lesson here. Horton's is a large bug that protects it self at all times. It lives underground they dig their way with their 4 front sharp legs. Females have just 3 spikes on it’s back to protect it self. The male Hornton has 4 spikes, the 3 spikes on it's back and 1 black spike. All the spikes are dangerous, because if you touch them you get a bad sting, way worse then a bee sting. Task Description:My class is learning about bug's and learnt what is the different between insect and bugs. We read a couple of some articles and created our own insect. We named it designed it and said what type of behavior it has and last at not least we created our insect. If you have read my paragraph properly you will see that it is a male, because a male has 1 black horn on it's head. Wow Daisy, what an awesome lesson you had out on the bike track. Thanks for Sharing! Today we got a surprise from our teacher. 5 of us that got picked to go out on the bike track. It was Awesome! First we had to sit down and talk about the important things you need. Your shoes, and your helmet. I really learnt a lot about shoes which was you Have to wear closed shoes not Sandals and not bare feet, otherwise your feet might get grated, just like a cheese on a cheese grater. I learnt that when you buy a helmet you should always check if there is a sticker that say certified product. Before you ride you must always check when you hold it a little tight that it doesn't have cracks, and you have the straps done up properly. Riding on the bikes was really fun. I had to make sure that when some one is at the front of me, that I have made enough room for them to come in case they are going to stop. We also learned how to stop safely, by using both brakes. My favourite part of the day was when I was riding and got to the zig zaged bridge. I accidentally stopped and made my friend Naomi fall. No one cried or was hurt, but we did laugh. Task Description: 5 people got picked and I was one of them. We talked about what we had to do before we got to ride on the bikes. When we finished the lesson about our foot wear, Helmet, obviously checking our bike and we also just talked about safety tips. The we got to ride! Thanks for sharing your maths thinking Awathan. I like the way you have shown your thinking both from your maths book, and in written form! Thanks Daisy for this piece of writing about native birds in Tāmaki. I agree with lots of what you have said, I have never seen a Kiwi in Tāmaki and Silvereye birds would be cute to have around. I also agree that Pigeons are annoying, so less of them might be a good idea! Why would having more native birds in Tāmaki be better? Because in Tāmaki native birds in New Zealand are very important to us. Birds are special they can help with different kinds of things. I haven't even seen a Kiwi in Tamaki so I think we need more because Kiwi’s are obviously important to New Zealand. Kiwis are also very talented. We just need more Kiwis because I'm not sure we have any Kiwis in Tamaki, and thats sad. I think Tamaki should have more silvereye birds because I have never ever seen a silver eyed bird. Not only in tamaki but everywhere, I go I only see magpies. I have also always wanted a silver eyed bird as a pet because it looks so cute. Some people think that Pigeons are very talented but most people think pigeons are just annoying. Well this is how Pigeons are annoying, you are just sitting there relaxing doing homework, then all of a sudden it is too hot and you open the window then a few minutes later a pigeons flies in, and you not sure how to get it out. So yeah I really want less pigeons in Tamaki. I think that Tamaki needs more Kiwis for people to see them in this area, because I have never seen a kiwi in tamaki yes some people can see them in other places in New Zealand but not in Tamaki. I also think we need more Silver eyed birds because they are so cute and people can do things useful instead of just lying in your house sleeping. As I said that Tamaki should have less Pigeons because they can really annoy you in your house or even in school. Task Description: Doing this was so fun learning about Birds being a bird expert. I also learnt that Birds actually eat bugs well not only because it is yummy, but because bugs eat trees and then birds eat bugs after that, birds poos and then a tree grows. So that was really interesting because I never knew that. Hope you enjoy my information about Birds.